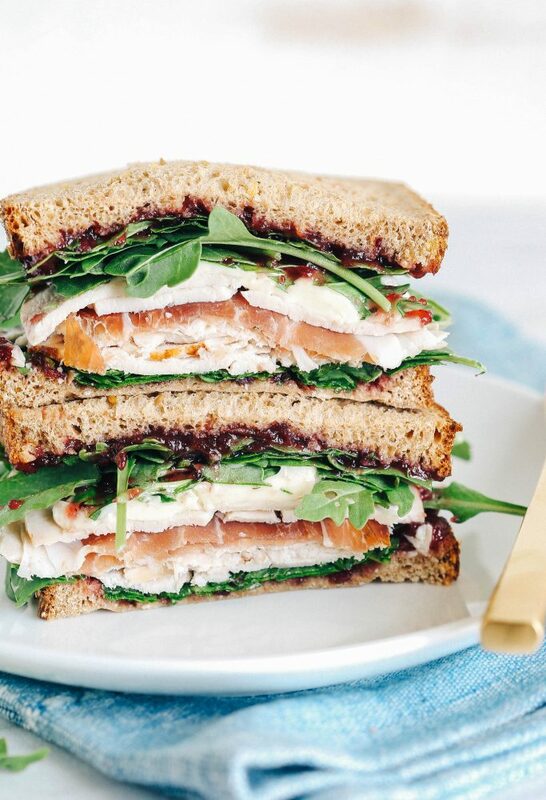 We know, endless Thanksgiving leftovers can seem intimidating and even boring, but this prosciutto sandwich from Eat Yourself Skinny is the answer to all your cravings. The moist and savory Prosciutto di Parma enhances that (maybe dry) leftover holiday turkey, while creamy brie and tarte cranberry sauce give it the ideal flavors to make it the ultimate comfort food after endless family dinners. Make this turkey and cranberry prosciutto sandwich even more perfect by serving with a cold beer and watching holiday movies on repeat next to the fireplace with your ugly sweater, of course. Spread a layer of cranberry jam on each slice of bread. Layer with slices of turkey breast and Prosciutto di Parma. To soften the brie, warm it up in the microwave for 5 to 10 seconds, then spread a thin layer of melted brie over the turkey and prosciutto. Top with arugula and season with a little salt and pepper, if desired. Slice and enjoy!